Post news Report RSS	New Patch - Chupacabra is now LIVE! Prepare yourselves for another dose of greatness. A substantial chunk of our time was spent improving and revising a few background systems, with a few still needing a little more polish before we make them live. One such system we’re putting quite a bit of work into is the Nugget pathfinding restructure. Prepare yourselves for another dose of greatness. A substantial chunk of our time was spent improving and revising a few background systems, with a few still needing a little more polish before we make them live. One such system we’re putting quite a bit of work into is the Nuggetpathfinding restructure. The improvements being made will ensure that Nuggets make better navigation decisions and avoid getting stuck in unfortunate situations. Additionally, another area receiving a lot of attention is the Creator Power system, which you’ll likely be very excited about. However, before we discuss that further, we’re also introducing a brand new system in today’s patch. Nuggets will very soon begin taking notice of your actions in the world. The more or less you interact with the world through your powers and influence will change the amount of Faith they have in you. This is divided into Fear and Love. You can decide what kind of God you’re going to be. Doing evil deeds or harming Nuggets in some way will increase their Fear. Showering them with hugs and rainbows will naturally increase their Love, so long as they don’t hate hugs and rainbows. Depending on their Fear and Love levels, Faith Towers will rise up in your civilization to indicate your Nuggets’ feelings towards you. We’re planning on adding different Research Perks based on Faith for you to play with in the future, as well as Nuggets acting a little differently based on their perception of you. As usual, this system is still very much in its infancy. We’ll be needing your feedback and patience to improve it in the future. Why bank on natural selection? Play the role of a divine matchmaker. Choose two Nuggets, climb inside those odd floating heads of theirs, and make them fall madly in love with each other. This way, they have the illusion of choice and you get to dictate which genetic attributes survive. Everyone wins. Hold down the Ctrl button and select the two Nuggets you wish to match. This power allows you to selectively breed Nuggets. As you know, we've added genetics and traits to the game, which will seriously affect your civilization in the long run. However, this extends to everything like skin color, hair color, and so on. You can mix and match however you please! Although, it's important to keep in mind that ending a relationship between two Nuggets for selective breeding will make them feel awfullydepressed about their sudden and rather confusing breakup. Is a building or Nugget looking a little under the weather? Give it a day at the “God Spa” to restore it back to its usual self. Well, unless the damage is emotional. There’s not much you can do about that. Hold down Ctrl and the Left Mouse Button to rejuvenate a target. Keep holding until the Nugget or Building becomes less likely to fall apart into tiny pieces. There is no such thing as a slow day in your civilization, no matter how Nuggets may feel. When their work ethic begins to dim, give them a sharp reminder of who’s really in charge. You can either select this power via the menu and press Ctrl +LMB to use it on a Nugget, or cast it instantaneously by holding Ctrl and double clicking on a Nugget. There’s no prescription quite like a delightful dose of joy and laughter. Give your Nuggets a little ray of sunshine to brighten their day. They tend to work harder when they’re happy. Once you’ve selected the power, hold down Ctrl and left click on a Nugget to give them a jolt of joy. Take nature’s fury for a spin! If you are looking to increase your Nugget’s Fear level and also catch a great show while you’re at it, then a tornado is just the thing for you. It’s almost impossible to control, but watching debris and Nuggets flying around can be weirdly satisfying. Hit Ctrl + LMB after selecting the power to start the tornado, or hold Ctrl and spin the mouse in circles for a quick cast (gesture not yet implemented). Let’s hope someone remembered to buy allergy medication, because it’s about to get awfully dusty around here. It’s not exactly a tornado, but thewindforce will certainly cause Nuggets to tie themselves around the nearest tree. This is an excellent way to spread some Fear in your civilization. After selecting it, simply hit Ctrl + LMB to introduce a little wind, or quick cast by rapidly blowing on your screen. Defy gravity and prove once and for all that you’re the most attractive entity in the galaxy. You can pick up any object on the planet and do with it as you please. Keep in mind, though, that Nuggets are very observant creatures, despite their apparent lack of eyes. Casting powers near to them will likely result in their puny little minds being blown. We are happy to introduce the Buildings List Panel. Now you can see all of your buildings sorted in one place. You can prioritize them, demolish them, and so on using the list. Later on, we’re planning on adding a building queue, which will allow you to sort which buildings you want to be completed first. Instead of running around eating dirt and performing potentially life-threatening activities, Nuggets can now spend their childhoods in schools learning from the collective knowledge passed down through the generations. In certain buildings, like the Refinery and Engineer’s Hut, educated Nuggets will be more productive. Some buildings will eventually require educated Nuggets to run properly, but you can still try and give the controls over to one of the village idiots and see how quickly they can set things on fire. You can get away with allowing students to teach themselves, but it will take far longer for them to understand the more complex stuff. Assigning a teacher to the building will increase education speeds. Every god comes across the problem of having to process an enormous amount of prayers. Fortunately, there is a modern solution to this. 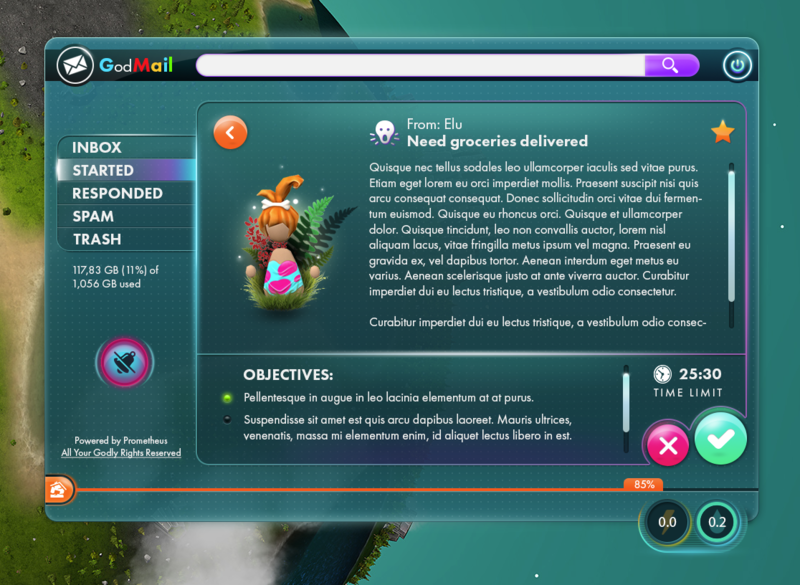 We are proud to introduce GodMail and the Prayer Enclave. Nuggets will finally have a special little place to ask you for help, send their regards, or possibly just annoy you with a fantastic heap of nonsense. Almost every prayer is going to be a new quest for you to solve or outright refuse. Accepting and successfully completing a quest will alter Faith substantially. 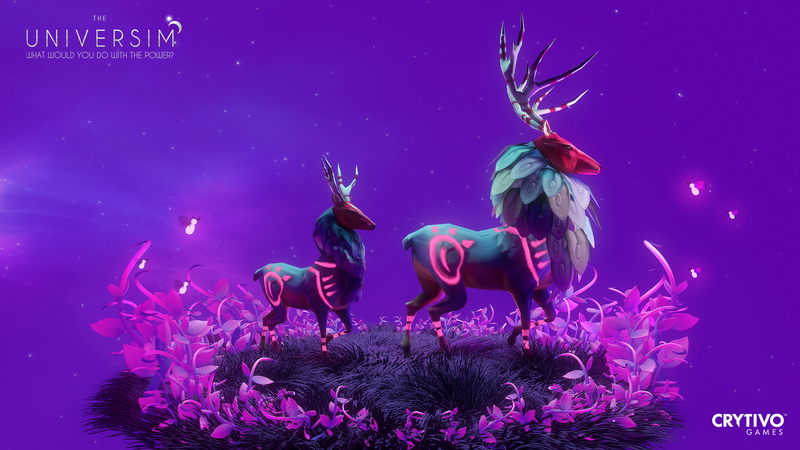 Pearl Deers now inhabit on a Mother Planet. You should begin seeing them wandering around, possibly in tight little family units. 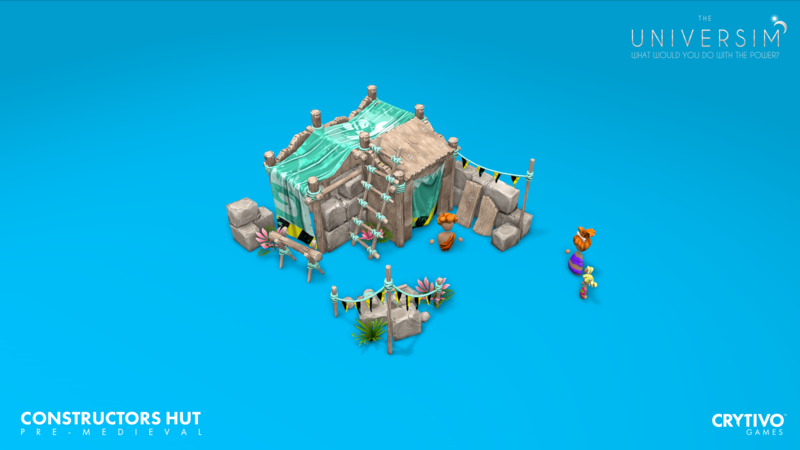 The Pre-Medieval Engineer’s Hut will make your Engineer Nuggets more productive. You can use educated Nuggets to improve things quite a bit. Nuggets can now see and feel your actions. Picking someone up will cause other Nuggets to flee. Such actions will increase Fear and decrease the Happiness of affected Nuggets. Creator Powers will now require Creator Points. Creator points are accumulated over time, which can be sped up by increasing Faith. The more you use these powers, the faster Creator Points will be generated. We are still going to balance this system quite a bit more, so please submit your feedback via the forums or Discord. Hitting the Middle Mouse Button or Tab on the keyboard will open the Creator Power Menu. Every power is activated by holding the Ctrl button down before clicking. Let us know what you think! Disappearing act: Fixed missing demolition model for Pre-Medieval Eatery, Cowsmetics, and Hair Saloon. Misinformation: Fixed the incorrect tooltip showing for pause and speed up buttons. Tooltip was actually from the clock. Cold case: Fixed missing localization for crops growing in winter. Stealing the spotlight: Fixed an issue where extending the Seasons Panel caused it to be overlapped by other elements. Homebound: Fix for the home button dropping picked up Nuggets. Stagefright: Fixed bug where Nuggets freeze after loading a game. Clearing the throat: Fixed Infected Area-related bugs. Devspeak: Fixed stack overflow error in NuggetActor.ToString() method. Sound of silence: Fixed an issue where the music stopped playing during the loading screen. Family therapy: Fixed Nugget Family Controller-related bugs. Accidental downgrade: Fixed Pump Upgrade-related bugs. Sticky water: Fixed camera accumulating water condensation issue when flying through clouds. Snowglobe: Snow and leaves are no longer visible from space. Call the locksmith: Fixed an issue in Creators Mode where buildings would be locked after Save and Load. No dice: Fixed a Research Perk draw issue producing empty slots. Flip the switch: Fixed various building panel ON/OFF button missbehaviour. Clarity: Fixed bush material. Now fruits disappear when bushes run out of food. The Idling Dead: Fixed an issue with standing dead Nuggets after loading a game. Firing squad: Fixed an issue where unassigning a Nugget caused a different Nugget to be unassigned. Green removement: Fixed fauna counts on the planet. Short term memory: Fixed an issue with Nuggets getting stuck while fetching resources. Job anxiety: Fixed bug during Nugget assignment to a Cemetery. Waterhog: Fixed water values displaying incorrectly in a disabled building’s panel. Creator Point accumulation starts only after Evolution Tower and Faith Tower are placed. Increased maximum number of blue perks generated. Creator Mode: Creator Powers will not require Creators Points. Refineries require educated Nuggets (School) for optimal productivity. Increased overall water capacity of water sources. Water should not deplete so easily now. Nuggets Kids now become adults in 2 Nugga Years. Nuggets Max Age was moved down from 50 to 40 due to Nugget Year time increase. Decreased time to refine the resources in Refineries and increased storage capacity. Blueprints - Diving headfirst into a project without planning usually results in a significant amount of headaches. Nuggets often learn this the hard way. It’s time to teach them how to draw up some proper plans before they start work on construction. Let’s also hope this will lead to the end of improvised techniques, like attempting to build a hut upside down and flipping it over later. Education - Education is essential to the success of any civilization. If Nuggets do not learn from past discoveries and develop some kind of reasoning, they will never be able to advance. It would otherwise just be a constant loop of stupidity and violence. News headlines that looped in that manner would be awfully sad to see, wouldn’t they? Hair Saloon new 3D model. Mesh and textures were optimized. 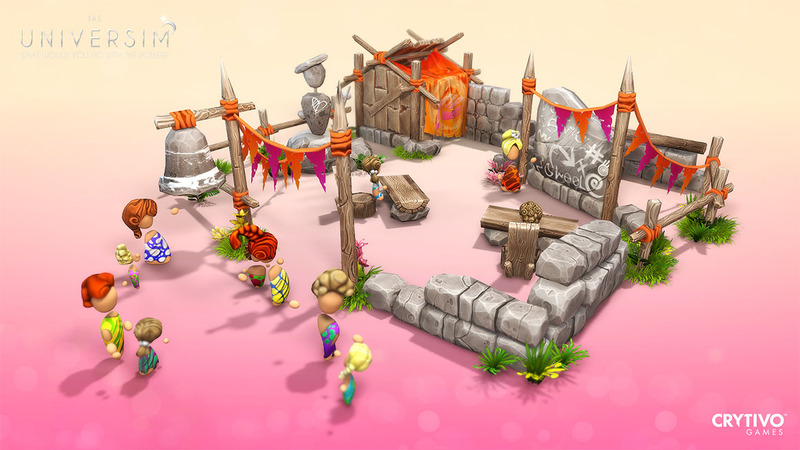 Love Tower building with construction stages added. Fear Tower building will now appear in the game. Accessories for Nugget teachers are available. Nuggets students now have accessories. New animation for teacher and student Nuggets is implemented. Deer 3D model with animations is implemented. Nuggets now have running animation. Added new normal map for Nugget leaf coverings. Naked Nuggets using leaves will only use a subset of clothes colors with desired tones (green). Removed unused info tooltip from upgrades panel. Removed a few unnecessary tips from loading screen. MainUI updates: added buildings list panel button, rearranged top right and left corners of mainUI, added current power window and its cost. Quick power selection scroll was added. New status messages for Nuggets were added. Going to school as a student, Going to school as a teacher, Teaching, Learning, Finished School, Taking a seat. Additional status was added to Nuggets dating - Bouquet of flowers. Construction menu update: added school construction icon, description and new render for cloud with description. Updated Engineer’s Hut panel. It can hold 4 workers now. Nugget ID Panel: Nuggets now have one universal character trait, until special one is generated. Nugget ID Panel: new education trait. Nuggets can be uneducated, school educated, and university educated. Nugget ID Panel: inverted Nugget portrait rotation direction. Nugget statuses updated: Nuggets going to school, heart (in love), and broken heart. Creator Powers menu has new icons. Creator Power menu carousel. This will allow players to quickly select a power. Icons for new Research Perks: education, heavy lifting, and blueprints. Improved object combination process on the planet. Reduced texture sizes on some objects. 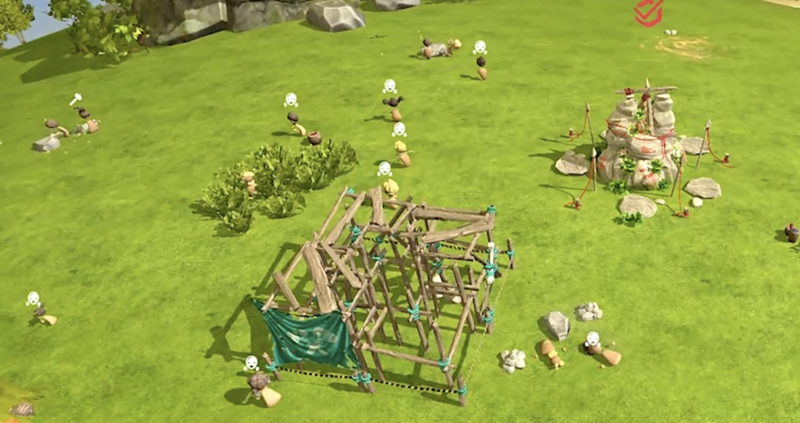 Improved animal culling: even though we added tons of new animals, the performance remains the same. Culling bushes and stones when they’re not visible. Improved Residential Hut placement process. Leaf particles added during Fall. Leaves on naked Nuggets will always stay green. Performance and stability issues when Warehouse is placed. Gravedigger still acts dumb sometimes. The new Pathfinding system should resolve this issue. Thank you all for sticking with us on this crazy ride! We hope you love all of the new additions, and we have plenty more in store for you. Stay tuned, stay in contact, and stay awesome!